The third part of the Corleone story began in 1979, about 20 years after Don Michael Corleone (Al Pacino) gave the order to have his older brother Fredo killed and eight years since Michael and Kay (Diane Keaton) had last seen each other after divorcing in 1959. Consigliere and adopted brother Tom Hagen (Robert Duvall) was now dead, replaced by BJ Harrison (George Hamilton), and the Lake Tahoe compound was in disrepair, as Michael had moved out of the casino business. In the opening scene set in NY, an aging 60s-ish Michael received the Order of San Sebastian from the Catholic Church at St. Patrick's Cathedral, a first step toward cleansing himself, breaking his ties to 'Mafia' business, legitimizing his violent reputation, and buying his way toward respectability, as well as finding a worthy successor. Michael had reached a semi-reconciliation with Kay and his estranged non-criminal son Anthony (Franc D'Ambrosio) (who aspired to be an opera singer rather than a lawyer), although Michael was still very close with daughter Mary Corleone (Sofia Coppola). Through the charitable Vito Corleone Foundation (fronted by his daughter Mary), Michael made a $600 million donation to presiding (and corrupt) church officer Archbishop Gilday (Donal Donnelly) to help the Vatican with its real estate/loan problems, and received in exchange controlling interest in an international real estate holding company multiconglomerate called Immobiliare (its largest shareholder was the Vatican Bank). Delays in the deal came about when Pope Paul VI died, and the transaction couldn't be ratified. Rarely without his bodyguards, Michael spent a day in the countryside with Kay touring his hometown, when he asked for her forgiveness ("I'm not the man that you think I am") and they contemplated their lives together ("I had a whole different destiny planned"), and Kay admitted her steadfast love for him ("I always loved you, Michael"). In the film's conclusion set in 1980 during the operatic debut (Cavalleria Rusticana) of opera singer/son Anthony attended by both Michael and Kay and other family members in Palermo, Sicily, another assassination attempt on Michael's life failed (although he was slightly wounded) after the performance on the opera house's front steps (but his beloved Mary was tragically killed when hit by the assassin's bullet directly in the chest, crying out: "Dad?" as she fell to her knees dead, and he agonized over her death). The film's coda was years later in 1997 with the anti-climactic, peaceful death from a heart attack of an aged, white-haired Michael at his Sicilian villa as he slumped over in his chair, while recalling the various loves of his life. With seven Academy Awards nominations (including the first for cinematographer Gordon Willis in this trilogy) and zero Oscars. With a production budget of approximately $54 million (four times that of Part II), but only $67 million (domestically) in box-office business and $137 million (worldwide). The film was severely criticized for the performance of Coppola's daughter Sofia, and was generally considered the weakest of the three. 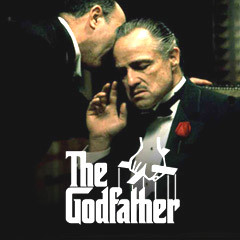 This was the only Godfather film without Robert Duvall. The film was released on Christmas Day in 1990. It was the first major movie to attempt to capitalize on a Christmas Day release in a significant way.